Super Savings Item! Save 38% on the EFFECTORS Real - unique Huge 24bit WAVE Multi-Layer Studio Samples Library on DVD or download by SoundLoad at Right Clearing. Hurry! Limited time offer. Offer valid only while supplies last. 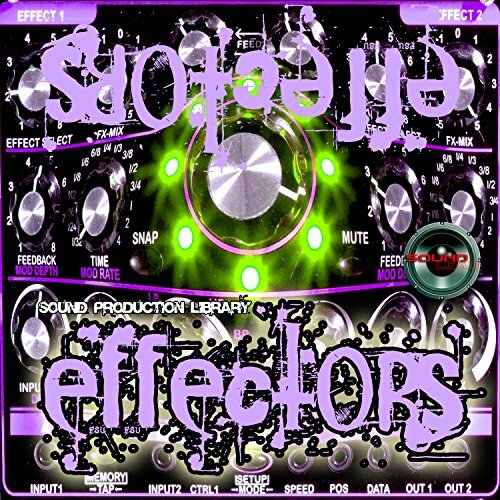 EFFECTOR`s REAL - Large unique production studio library over 4.4GB over 12,000 objects & element Multi-Layer WAVEs Samples on DVD or for download. EFFECTOR`s REAL - Large unique production studio library over 4.4GB over 12,000 objects & element Multi-Layer WAVEs Samples on DVD or for download. Real Effects of: nature & synthetic, wind & waves, ambiences, cinematic, cosmic, air, outer space, under water, horror, wavescape, streets, sports, drones, glassing, noises, ethereal pars, synth pads, deep pads, alien attacks, robots, lost in space, rotations, lasers, 3D magic, zoolook, urban traffic, SFX assortment, midwest outdoors, vocoder and more. Effects of major famous synthesizers: YAMAHA, Roland, KORG, Oberheim, Moog, E-mu, Virus. Drums, percussion, instruments synthetic & fx loops, groves, performances, combos. This library very useful for TV/Radio/Movie/Advertising production, mixing/remixing/creating new SONGS! >>>>>>>>>>>>>>>>>>> We offer a HUGE unique collection of hard to find, very rare instruments and sounds, production kits, loops and grooves and many other TOOLS for successful and quality work, music composing and creating, pre/post production. All original samples in WAVEs format, single and multi-layer, mapped and ready for download and work: LEGENDARY MELLOTRON, ARP-ODYSSEY, ARP SOLINA STRINGS, JUPITER-8, MATRIX12, MINIMOOG, HAMMOND, WURLITZER, RHODES PIANO. This ultimate collection offered is an excellent for any musician at any level, for anybody looking to get into sample-loops-based music/recording, are designed to grow and expand with you into complete and professional sounds. Very easy to work: recording, looping and creating perfect sound. EFFECTOR`s REAL - Large unique production studio library over 4.4GB over 12,000 objects & element Multi-Layer WAVEs Samples on DVD or for download. This library very useful for TV/Radio/Movie/Advertising production, mixing/remixing/creating new SONGS!